A lot has happened around the farm the last three weeks, and I feel duty-bound to get you folks caught up to speed. Instead of a long written narrative, though, I'll let a few photos tell most of the story. We have had A LOT of cows and heifers calve during November. A majority of their calves have been bulls, but that'll get turned around sooner or later. Thanks to all the "fresh" cows, our milking herd has climbed up to 207 cows. This is the first time we've eclipsed the 200 mark in well over a year. The switch back to Standard Time means we have the opportunity to see the first light of morning and sunrise every day before we finish the morning milking. A larger milking herd (and those cows increasing their production) means that we're spending more time in the barn every day. My wife and kids have had to leave for school some mornings before I could get home for breakfast. But on the plus side, more cows = more milk = FULL MILK TANK!!! ...and we've generally been finishing both the field and milking chores just before sundown. Though it's cold and lonely in the deep, dark night...I can see to plant my wheat by the GPS light. Despite the long, busy days on the farm, our family has still been able to find our way to Dear Old State for a couple of ballgames. And the sun comes up again each morning, bringing with it new challenges, new opportunities, and a renewed sense of appreciation for the wonderful life I've been blessed with. Thanks to modern technology, I have the ability to share real-time updates about what is happening on my farm to a virtually unlimited audience. My favorite "on-the-go" social network is Twitter, and today I decided to tweet out how many cows we had milked throughout the course of this afternoon. It didn't take long before I started growing bored with it, so I decided I would try to share the information in a more creative manner. Make that 80 cows milked. 100 cows milked, 78 to go. CX of CLXXVIII cows milked. "We dun gone an milked ahunnurtinfawty cows, PAAAWWWWLLLL!" I would have already drained 5.33 suitcases of Busch Heavy if I slammed a beer every time I milked a cow this afternoon. And I'd be dead. BREAKING: Gilmer Dairy Farm (Lamar Co., Ala.) successfully completed the milking of 178 mature, lactating Holsteins as of 3:55pm CDT. The first week of our summer/fall silage harvest will be coming to an end later this afternoon, and so far I am very happy with our yields. We're averaging 14 tons of chopped corn per acre on the first 22 acres harvested, which is about as good as it can get for the ground we planted it on. And not only are we chopping lots of "cow food", it looks like the feed quality is also going to be pretty good. It will be interesting to see if we can maintain these yields as we finish our corn crop, which we should be able to do next week barring weather delays or major equipment issues. 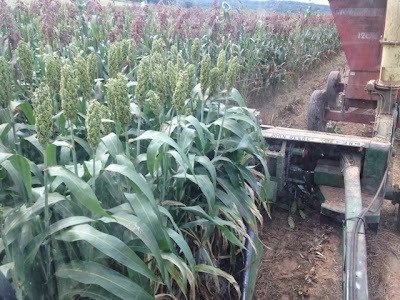 After we finish the corn, we'll move into the sorghum crop. While we've had a few minor, inevitable equipment issues, preventative maintenance has keep the chopper in the field and out of the farm shop. Our attempt to bale hay this week as pretty much been a disaster. We were able to get nearly 100 bales off of half of our cut acreage, but it is going to be some really low quality stuff. After yesterday afternoon's brief shower (the fifth straight day of rain), we decided to let the remaining hay sit until next week. Some we will bale and then use as "erosion control". The rest we'll allow to rot down and essentially re-fertilize the fields. All is not as gloomy as the clouds we've been seeing over and over, though. The wet weather that has plagued our hay harvest this week has been very beneficial to our silage crops. We have replaced a few parts on our silage chopper and hope to have it back together by sometime tomorrow. Our plan is to chop just enough this weekend to feed "green chop" to the cows before we go into full-scale silage harvest mode next week. We will start with our corn and then move into our BMR sorghum varieties. Wet hay say, "Bale another day." I've always heard that the ideal time to cut burmudagrass hay is 30-35 days after the previous cutting. Well, that's exactly what we did with 52 acres of the stuff last Thursday and Friday. At the time, the weather forecast showed a fair chance of rain on Saturday, and then nothing greater than 20% before the chances rose to 50%+ during the second half of this week. Our thought was that it would have enough time to dry even if it did get a little wet Saturday, and we should have it all baled and hauled out of the fields by the end of Wednesday. It stayed cloudy but never rained on Saturday. Meanwhile, the greater rain chances shifted to the first of the week. We got 0.1" of precipitation during an afternoon-long mist/drizzle on Sunday. The not-fully-dried-out hay was now wet. We never saw the sun on Monday, but we did see a couple of short downpours. Needless to say we never made it into the hayfield. By midday today we were finally getting enough sunshine to start giving it a try. I spent 3.5 hours "fluffing" some of the hay with the tedder to speed up the drying process, and by 4pm the first 10 acres was dry enough to bale. As luck would have it, though, a stray rain shower found its way into the field just as the hay rake and baler were doing the same. Once again, hay baling must be postponed another day. I guess there are two things that we can learn from the events of the past few days. First of all, never place too much faith in a weather forecast beyond three days. And secondly, a farmer can ALWAYS find an opportunity to complain about the weather, even in the midst of one of the best summers weather-wise in recent memory. For the first time since late May, my wife and kids were up and ready to go before I made it back home from the morning milking. Yes, today is first day of the new school year. 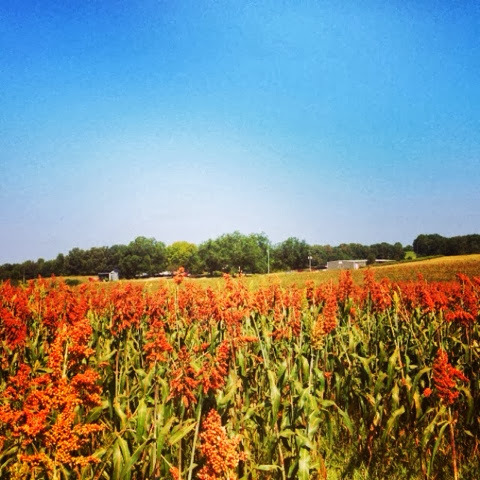 Summer break is over, and, coincidentally (or not), so is my hiatus from this blog. The story over the last 10-12 weeks has definitely been the weather. Other than a dry stretch during the second half of June, we've had more than adequate amounts of rainfall and the summer heat hasn't been nearly oppressive as normal. In fact, I dare say we've had a few days of very "comfortable" weather this summer. Though late getting it planted, our silage crops look to have taken advantage of the extra water, and our first cutting of bermudagrass hay was outstanding. The second cutting is currently on the ground, but yesterday's drizzle and this morning's clouds will likely either delay or postpone the baler going into the field. Well, it's 7:30 and time to get back to work. You can follow me on Twitter (@gilmerdairy) for a "play-by-play" of the work day, and I'll occasionally post a photo or short farm video there, too. So until next time, y'all have a "dairy' good day! Raise your hand if you want to serve your family milk and dairy foods that contain antibiotic residues. Yeah, I didn't raise my hand either. The subject of on-farm antibiotic use has been coming up a lot in conversations lately. People want to know how it affects food quality and safety, as well as the possible long-term resistance issues that could be associated with their use. 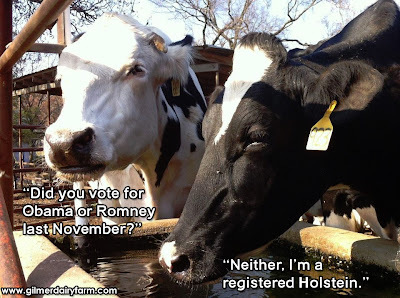 As a farmer and food provider, I have a responsibility to both my cows and my customers. The judicious use of antibiotics helps keep my cows healthy, and our quality-control procedures ensure that all of the milk that leaves our farm is safe, wholesome, and residue-free. I recently wrote a blog post for the Food Dialogues website explaining the steps we take on our farm to strike the balance between herd health and food safety. As you read through it, I hope it clears up some questions you might have about our farm practices and the dairy products you buy. It's that time of year again...time for our annual Milk Mustache Contest! 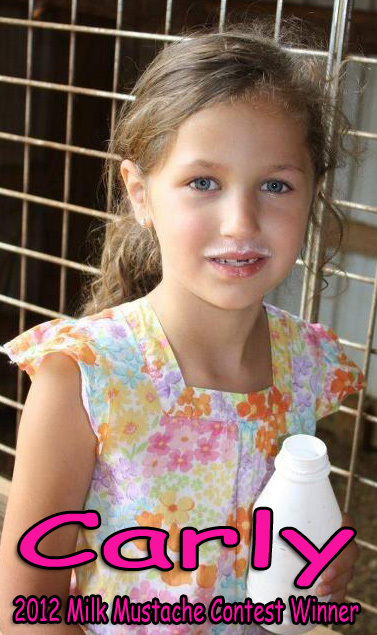 Last year we received more milk mustache photos than ever before, and we hope you will send in even more this year. To enter, take a photo of you or your child proudly and prominently displaying a milk mustache and either post it to our Facebook page or email it to " gilmerdairy [at] gmail [dot] com ". Be sure you include the first name, age, and home state of the person in the photo! All entries must be received by Saturday, June 8. Filtered photographs such as Instagram will be accepted, but please do not add special effects or text to the picture. Originality, "cuteness", and milk mustache visibility will be considered during the selection of finalists. We will announce the finalists on June 10 and allow our Facebook fans to vote for their favorite milk mustache photo. Depending on the number of entries, we may also include a semifinal round of voting to select two finalists. 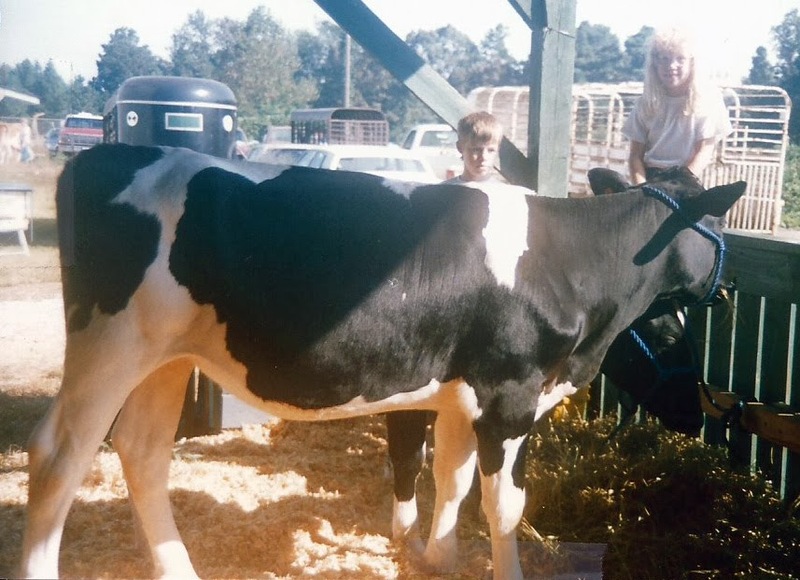 The winner will receive a prize and be highlighted as part of our celebration of June Dairy Month. In years past, we've had winners all the way from North Dakota to south Mississippi. This year, it might just be you...but only if you enter! So grab your camera and a glass of milk, say "CHEESE!!! ", and help us celebrate June Dairy Month by entering our annual Milk Mustache Contest! Here's a little photo of Spike & Pet I put on our Facebook page this morning. I hope you get a chuckle! Teat dip is an essential tool we use on every cow every time they come into the milking barn. So what is it (note- for what it is NOT, search my 3/8/13 twitter timeline for #teatdip)? 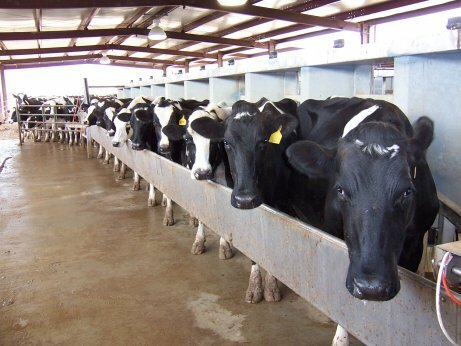 Teat dip is bacteria-fighting substance applied to a cow before and after milking. 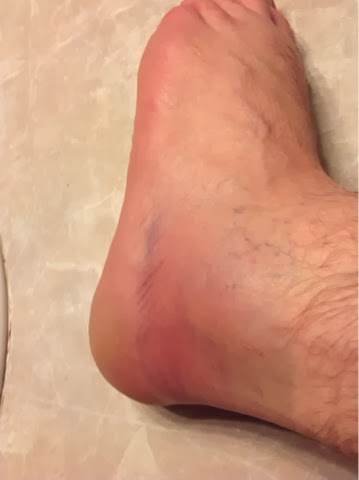 There are several different brands and formulations, but most that I am aware of use low levels of iodine as the active ingredient. Using teat dip helps to prevent mammary infections, thereby promoting good udder health and high-quality milk. 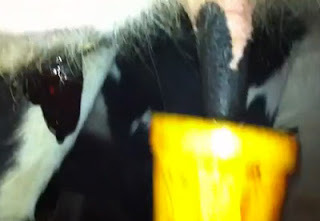 As you'll see in the video below, "pre-dip" is applied and wiped off before a cow is milked. The pre-dip kills bacteria on the outside of the cow's teat. 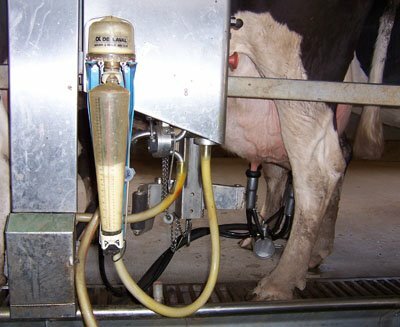 If left unchecked, that bacteria could work its way up into the teat during the milking process and cause an infection. An infection could then lead to lower milk quality, a decrease in milk production, health issues for the cow, and the potential need to combat the infection with antibiotics (at which point the milk would be "dumped" for several days). When the cow is finished milking, we apply a "post-dip". The post-dip accomplishes two things: 1) it fights-off bacteria until the cow's teat-end orifices can seal themselves off, and 2) it contains skin conditioners that help keep the cow's teats soft and supple. I hope you enjoy this edition of GDF Vocowbulary, and maybe you will learn a little something about teat dip! Hey, folks! I'd like to apologize for the lack of blog activity over the last couple of weeks, and hopefully this MooTube Minute will catch you up to speed on what's been happening on our dairy farm lately.